Here is the map for last weeks Dragonlands game. Each player took the part of a dragon inside an egg. One way or another, they all emerged fully grown on an island and found they were telepathically connected to other dragons. No dragons fought but some 'coerced' others. Few dragons bothered flying because most could swim and they all discovered they were Wish-dragons the bigger the wish, the harder the saving roll but teleportation was no big deal. 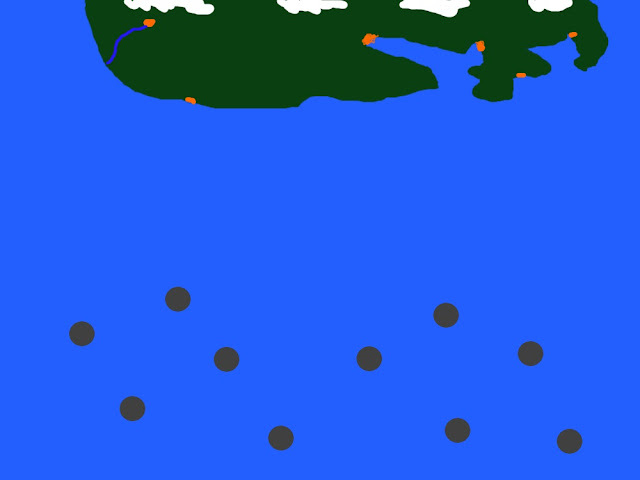 After minor skirmishing - they destroyed a fishing boat, drove pirates on to an island and ate an orca - they forged an alliance with Lord Arrowheart, owner of the biggest treasury in these parts (dragons measure gold by the Claw), they gained special abilities by virtue of this co-ownership of a sufficient quantity of gold. Then, when the Dragonman aarmy came from over the Snowy Mountains, the dragons led Lord Arrowheart's four regiments into battle and routed the enemy, avoiding slavery and becoming fully-fledged Wish-Dragons evaluating and granting the wishes of other dragons in service of the great dragon god, Hormuz. Wow! What an adventure! I want to hire you as full time GM and scenario writer, Mark. I just have no way to do so. Carry on! Where is the LIKE button for THE atroll's comment?